Helping others plan their layout is a fun activity which doesn’t cost anything. At least it doesn’t cost me anything; some of my friends though might have a different opinion. 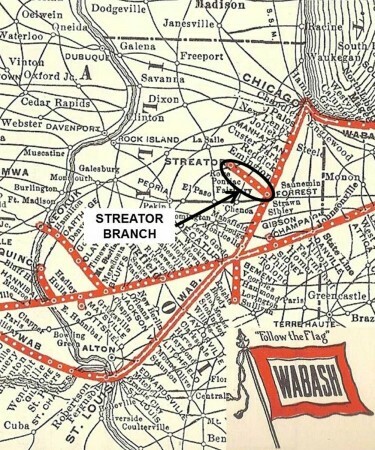 I’m currently helping with a layout concept based on the Wabash Railroad’s Streator branch. This was a line which originated from a small yard on Wabash’s Chicago/Decatur main line at Forrest, Illinois, and headed northwest to Streator Illinois. To access the branch, the Wabash had trackage rights on a short section of the Toledo, Peoria & Western (TP&W) from Forrest to Fairbury. A major industry in Fairbury, which was switched by both the Wabash and the TP&W, was Honeggers’ Feed. 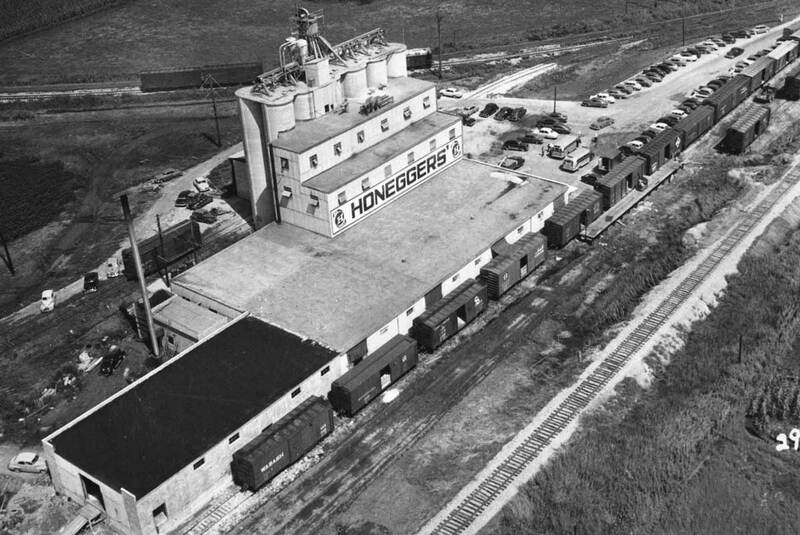 Honeggers’ main business was the production of chicken and hog feeds. Jeff Halloin shared this history of the Honeggers operation. Photo courtesy of the Fairbury Echoes Museum and used with their permission. The inbound tracks were on the north side of the feed mill which was the Wabash side. The track curving up to the left is the Streator Branch. Inbound loads were such items as oil meal, alfalfa, paper bags (large bags for feed loading), molasses, soy bean meal, fish oil and oyster shells to name a few. The track along the south side, or TP&W side was the outbound track. Later a second track was added on the south and both tracks were covered. Note how each boxcar on the south loading dock track is spotted by a loading door. Much of the information we have on the Streator Branch and operations at Honeggers’ is from Chet French. Chet is a retired Illinois Central engineer who grew up in Forrest, the terminal of the branch. Chet takes over here with his first hand description of the operation. The mill was finished sometime in late 1951. I would guess the photo might be from 52 or 53. The photo I attached was taken in the mid to late 1950’s. By then the loading track on the south side of the building had been enclosed and I believe the second short track in your photo also was extended west and was also enclosed. Both tracks were accessed from either end. The inbound loads were spotted on the Wabash side of the mill. Those tracks could also be switched from the west end by the TP&W. A large amount of the inbound loads came via the Wabash. No doubt the TP&W handled some also. I am not sure if the Wabash switched the two feed loading tracks or not. TP&W #24, the east local, switched the loading tracks in the late morning. Any loads for the Wabash were set on the track next to the Wabash main. I believe there were two side tracks, one on each side of the Wabash main. My guess is that #24 also set any inbound loads on one of the Wabash side tracks for the Wabash to spot. Wabash 2459 is crossing the New York Central just south of Streator on November 4, 1950. Photo taken by Paul Slager, from the Chet French collection. Sometimes the Streator local would pick up the loads on the northward trip and sometimes on their trip back home. It probably depended on what time #24 got to Fairbury. 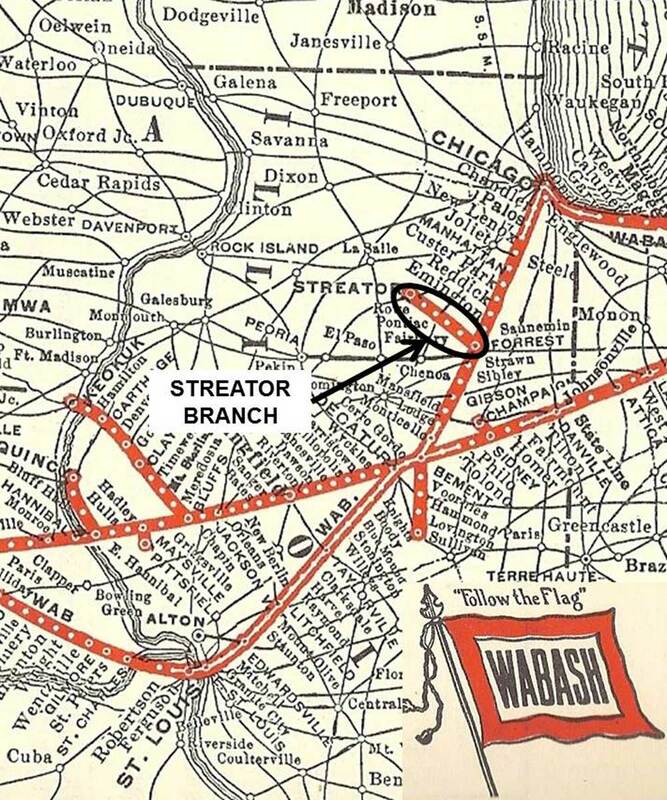 During times when there was only one branch job, the Streator job would also switch the inbound tracks on their way north. By looking at the inbound train lists, you can tell which way the Streator local picked up the cars. If they got them going north, they were usually in the middle of the train. Picking them up coming home, they were next to the engine. When the Cornell Turn switch local was put on, they would usually get to Honeggers’ about midnight. They had a standing order to get to Fairbury and interchange the MTY box cars for Honeggers’ to the TP&W before midnight and before TP&W #25 arrived. TP&W #25 was the west local and they did the largest amount of switching at the mill. The Cornell turn would switch the inbound tracks and bring any loads back that #24 and #25 switched out for them. The turn would also go north and switch the elevators at Champlin and Lodemia, and also the elevator and seed house at McDowell. On a rare occasion, they might have to go all the way to Streator to give Smith Douglass a switch. When the Cornell Turn was on, the Streator local didn’t do any work at Honegger unless they had a hot load going north that needed spotting. Now we need a good photo of the mill where we can read all the signs. Make some decals and it would make an awesome structure. As freight car modelers we go to great lengths to ensure the accuracy of our models. Information on industries such as Honeggers’ helps us operate those models to the same level. Here are details from switchlists used in August 1955 to work the Honeggers complex. This post kicks off a series of articles on the Streator Branch, its traffic, and related freight cars used. The purpose is to tie freight cars and their operations into a prototype setting to gain knowledge on the true nature of how railroads worked. Think of this as a doctoral level “Railroads You Can Build” class. I’ll be following this blog closely. I’m in long-range planning for an HO layout of the NYC Kankakee Belt including Streator. If you do this plant justice, you may not have room for the rest of the Streator branch.